Is Country Music's Relationship With The NRA Shifting? : The Record The names of featured artists no longer appear on the website of a program linking country music — a genre not known for stepping outside its comfort zone — with the National Rifle Association. 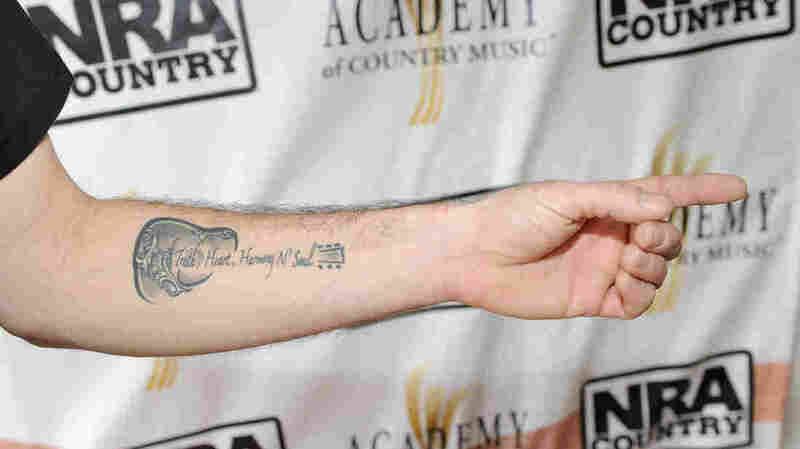 The tattoo of musician Josh Thompson, photographed while attending the NRA Country/ACM Celebrity Shoot hosted by Blake Shelton at Nellis Air Force Base on April 2, 2011 in Las Vegas, Nevada. Following the mass shooting in Las Vegas last Oct. 1, which began while country star Jason Aldean was performing as the final act of the final night of the Route 91 Harvest Festival, another country singer who had played the event, Lee Brice, appeared on a local news station in South Carolina. In his appearance, Brice said, in reference to the massacre of 58 people, that "Satan is trying to send out his evil into the world" and that "country music will rise above." The Route 91 Festival's violent conclusion became a cultural crossroads — of debates around gun control, political divisions and country music's position between them. The genre's artists have a reputation as being open to expressing moral stances, but not directly political ones. Fans "don't want to be preached at from a perspective, liberal or conservative," Gerry House, a songwriter and former radio host, told Billboard last year. "Most of our artists will stay quiet and appropriately solemn," one anonymous executive told Popdust in 2013 following the violence at Sandy Hook Elementary in Dec., 2012. Even relatively apolitical shows of support can face dissent — Tim McGraw, a superstar of the genre, received criticism following his decision to perform at a Sandy Hook benefit show. Over a month after the Route 91 Festival shooting, Jason Aldean appeared on the Today Show to reflect on the bullets directed at his audience while he performed. "Our country spends too much time arguing with each other," he told the program, "but doesn't spend enough time working on the issue that's really the problem." Following the shooting at Stoneman Douglas on Feb. 14, NPR Music reached out to Aldean's representatives, to request clarification on his comments to Today, since the issues he had referenced last winter would seemed to have reared their heads again, which they declined. The overlap between gun owners and country fans is taken as a given by many, and is encapsulated in NRA Country, a program from the lobbying and advocacy group that is self-described as being "a celebration of American values" and "a lifestyle and a bond between the best and brightest in country music and hard-working Americans." Previously, it had worked with country music artists including Brice, Justin Moore, Hank Williams, Jr., Trace Adkins and Tyler Farr, among many others. Prior to Lee Brice's interview with that local news program, which was conducted in early October, NPR Music requested a comment from Brice on whether the violence at Route 91 Harvest had affected his views on gun control regulations. The request was declined. Following the killing of 17 at Marjory Stoneman Douglas High School on Feb. 14, NPR Music again reached out to Brice's representative, who did not respond to a request for comment. In the midst of this climate, a recent website redesign has drastically changed the current perception of NRA Country's health. Though its "About" section, as quoted above, still mentions music, the group's past work with country artists is removed. At press time, an events page featuring two concerts around the organization's upcoming Annual Meeting (where Randy Rogers Band, Scooter Brown Band, The Charlie Daniels Band, Travis Tritt and Larry Gatlin and The Gatlin Brothers will perform), scheduled for May 4 and 5 in Dallas, is all that remains of the program's music associations (a change first pointed out by Rolling Stone Country), other than merchandise that features images of guitars. Multiple requests for comment from NRA Country — in October, in February and following the recent removal of its past cross-promotions — were not returned. It's worth noting, perhaps, that following the Route 91 Harvest shooting, the program's Twitter feed did not post for three weeks, until Oct. 24, at which point it resumed posting with regularity. At press time, the account has not posted since Feb. 14. The debate around gun control has been, largely owing to student involvement nationwide, more extensive and more enduring than in the past — so much so that the NRA itself seemed to signal a position shift yesterday. Whether that shift will continue — into Nashville and beyond — remains to be seen. Absence, though, can still be read as a decision.